Based on our Tested and Recommended RDV Platform, the RDV Command represents a high quality, affordable command vehicle. Designed based on needs expressed to us by numerous law enforcement agencies, the RDV Command encompasses the same deployment attributes as our RDV with the additional benefits of a command center. With budgetary constraints, the need for operational tools to perform multiple tasks is paramount. The RDV Command satisfies this requirement. With our custom fabrication ability, we can build the RDV Command to suite your department’s tactical command vehicle parameters. Whether you require a lockable gun cabinet, operational center with TVs/Computers, electronic surveillance equipment, filing/storage cabinetry, etc., the RDV Command can provide the solution. Add these abilities to a vehicle that can be used as a quick response vehicle for warrants and/or special operations, you have one of the most versatile tools available to your department. As with our RDV vehicle, The Armored Group has focused on furnishing a well equipped RDV Command at an affordable price. 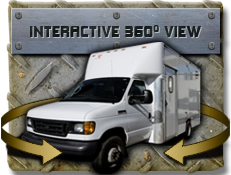 Multiple areas of use; Hostage Negotiators, quick response teams, DWI check points, etc.